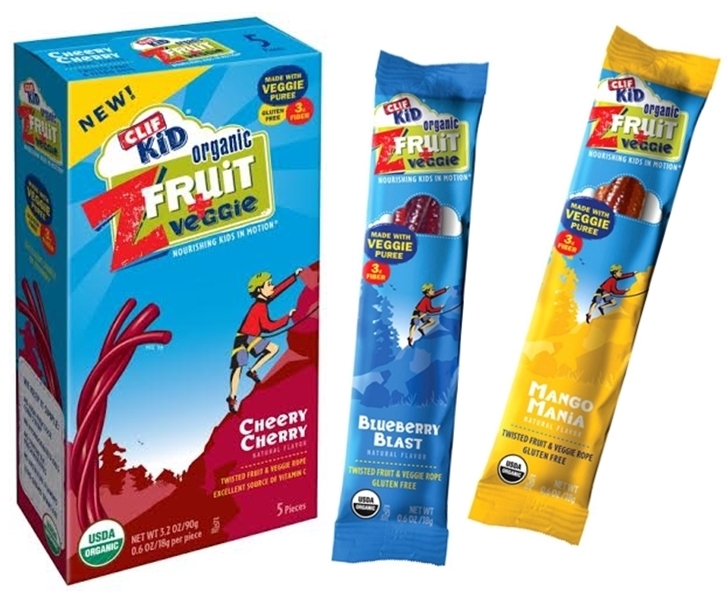 CLIF Kid‘s new CLIF Kid Zfruit + Veggie ropes offer a clever way to get more veggies into your kiddos. More than nutritious, these twisty ropes make snacking on-the-go tasty, fun and easy. New veggie ropes are 100% certified USDA organic and made with healthy vegetable puree. Each rope is a good source of fiber and an excellent source of vitamin C. Plus, CLIF Kid Zfruit + Veggie ropes are gluten-free, not to mention free of partially-hydrogenated oils, high fructose corn syrup, trans fat, synthetic preservatives and artificial flavors. CLIF Kid Zfruit + Veggie ropes come in three lip-smacking flavors kids will adore: Blueberry Blast, Cheery Cherry and Mango Mania. You can pick up a box (or two or three!) at your local natural food retailer, grocery store or at the CLIF Bar website. CLIF Kid's new CLIF Kid Zfruit + Veggie ropes offer a clever way to get more veggies into your kiddos. More than nutritious, these twisty ropes make snacking on-the-go tasty, fun and easy. New veggie ropes are 100% certified USDA organic and made with healthy vegetable puree. Each rope is a good source of fiber and an excellent source of vitamin C. Plus, CLIF Kid Zfruit + Veggie ropes are gluten-free, not to mention free of partially-hydrogenated oils, high fructose corn syrup, trans fat, synthetic preservatives and artificial flavors. CLIF Kid Zfruit + Veggie ropes come in three lip-smacking flavors kids will adore: Blueberry Blast, Cheery Cherry and Mango Mania. You can pick up a box (or two or three!) at your local natural food retailer, grocery store or at the CLIF Bar website.